Georgetown’s football season may have ended with a disappointing 34-12 loss to Lehigh, but that hasn’t stopped the Hoyas from continuing their new-found winning ways. The Patriot League announced its post-season awards yesterday, naming Hoya defensive end Andrew Schaetzke Defensive Player of the Year and head coach Kevin Kelly Coach of the Year. Expectations were high for Schaetzke this season after being named to the Patriot League First Team last season, and the senior didn’t disappoint. Schaetzke anchored the stout Hoya defense, leading the Patriot League with 22.5 tackles for a loss and 13 sacks. He finished his career with 30.5 sacks, good for second all-time at Georgetown. The defensive end also had three forced fumbles and an interception on the season. Kelly, who entered his sixth season at the helm of the Hoyas with a 9-45 record, earned Coach of the Year honors by leading Georgetown to its best record since 1999. 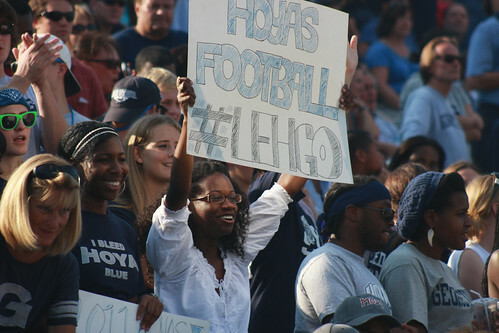 The 8-3 Hoyas doubled their win total from last season and would have made the Division I Football Championship Subdivision playoffs had they beat Lehigh. Kelly helped Georgetown realize major improvements on both side of the ball–the Hoyas finished 15th in FCS in scoring defense, and the offense was a model of efficiency, scoring on 92 percent of its red zone opportunities, good for third in the nation. Both Schaetzke and Kelly will have the opportunity to pick up more hardware, as they were named finalists for the Buck Buchanan FCS Defensive Player of the Year and Eddie Robinson FCS National Coach of the Year awards, respectively. Joining Schaetzke on the Patriot League first team defense are juniors Robert McCabe and Jeremy Moore, who also made the first team offense as a return specialist. Cornerback Jayah Kaisamba, running back Nick Campanella, offensive lineman Mike Roland, and kicker Brett Weiss all made the conference second team.